This is a list of law enforcement agencies in the state of Nebraska. According to the U.S. Bureau of Justice Statistics' 2008 Census of State and Local Law Enforcement Agencies, the state had 225 law enforcement agencies employing 3,765 sworn officers, about 211 for each 100,000 residents. 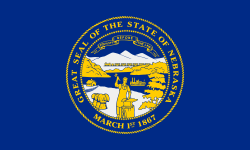 Nebraska Department of Motor Vehicles, Driver & Vehicle Records Division, Fraud Investigation Section - "performs investigative work relating to vehicle title and registration fraud, driver's license fraud, and odometer fraud. Motor Vehicle Fraud Investigators are certified Nebraska Law Enforcement Officers commissioned as Deputy State Sheriffs." ^ Brian A. Reaves, 2008 Census of State and Local Law Enforcement Agencies, by United States Department of Justice, Office of Justice Programs, Bureau of Justice Statistics (July 2011), p. 15. ^ Enforcement of the Nebraska Pesticide Act, Nebraska Department of Agriculture (accessed September 11, 2016). ^ Fraud Investigation Section, Nebraska Department of Motor Vehicles (accessed September 11, 2016). ^ Conservation Officers, Nebraska Game and Parks Commission (accessed September 11, 2016). ^ "Police Department". Beatrice Police Department. Retrieved 26 February 2017. ^ "Cop Who Fatally Shot Unarmed Suspect Resigns". Huffington Post. Reuters. 24 March 2015. Retrieved 30 March 2015. This page was last edited on 23 March 2018, at 03:24 (UTC).